Why has Labour’s lead over the Tories fallen this month? Posted in Politics on April 28th, 2013 by Leo – Comments Off on Why has Labour’s lead over the Tories fallen this month? 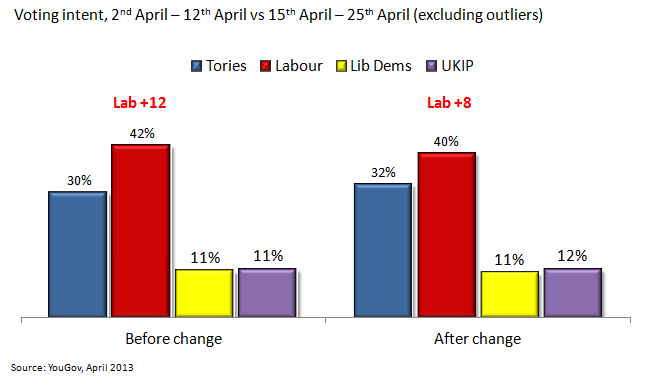 Two weeks ago, Labour’s lead over the Tories fell several points over a weekend. It’s still big enough to give Labour a decent majority, but it’s the first sustained shift of this size since the Tories’ omnishambles last spring. There’s been some speculation about why the polls changed. Was it because Thatcher’s death reminded a bunch of people that they loved the Tories after all; because the welfare debate hurt Labour; because Tony Blair was nasty about Ed Miliband in the New Statesman; or was it the belated unwinding of the gains that Labour made in 2012? The reason the question of why it happened is important* is that some changes are only temporary – usually when there’s been an external news story or a well-received political setpiece. But politics news that says something new and fundamental about one party can produce a more lasting realignment. This is what happened after the omnishambles budget – and it’s what some are saying is happening to Labour with the welfare debate (in a bad way). The detail of who has switched might give us a clue about why things have changed. This post is the latest in the series on Carbon Brief’s energy and climate change poll. It was written by Ros Donald and the original was published here. People in the UK overwhelmingly trust scientists more than any other source to give them accurate information about climate change, according to a new survey. In contrast, politicians and social media come joint last on the list. According to a new poll conducted for Carbon Brief by pollsters Opinium , 69 per cent of those asked agreed that scientists and meteorologists are trustworthy sources of accurate information about climate science. Only seven per cent disagreed that scientists could be trusted to do this. Next highest came ‘green’ charities such as Greenpeace and Friends of the Earth, and BBC journalists and commentators, with 39 per cent and 31 per cent respectively saying they trusted these sources. But these groups divided opinion – 23 per cent don’t trust green charities, and 25 per cent think the BBC can’t be trusted to provide accurate information. While scientists topped the trust league table, politicians, blogs and social media came bottom. Only seven per cent said they considered politicians to be reliable sources of climate change information – and websites and social didn’t do any better, also scoring a seven per cent rating. 64 per cent said they didn’t think politicians could be trusted to give them accurate information, compared to 53 per cent for social media sources. Question: How trustworthy do you think the following information sources are in providing you with accurate information about climate change? Carbon Brief’s results tally closely with a previous study Ipsos Mori carried out last February for Climate Week of around 1,000 respondents. Asked whose views they trust on climate change, 66 per cent of those asked said they trust scientists the most. In this survey, celebrities were deemed least trustworthy, with only one per cent professing trust in their views on climate change. Carbon Brief’s poll has tons of interesting findings – some of them covered in last week’s blogs. But as with any apparently new information, it’s useful to put the results in the context of what we’ve seen before. How does the poll fit with what others have shown? I’m going to pick on three places where it’s interesting to compare the new poll with previous ones. I’ve been banging on about this for a while. Poll after poll is showing that belief that climate change is real and man-made is at the same level it was at before Copenhagen, ‘climategate’, the UK’s cold winters, and the subsequent dip in belief. It really is time we stopped saying that belief in climate change is falling. But when I’m not banging on about the fact that climate denial isn’t rising, I can usually be found arguing that focusing on ‘belief’ in climate change misses the point. One of my favourite charts is from a post-Copenhagen poll that showed that, even among those who said they don’t think global warming has been proven, a majority wanted a reduction in worldwide emissions. 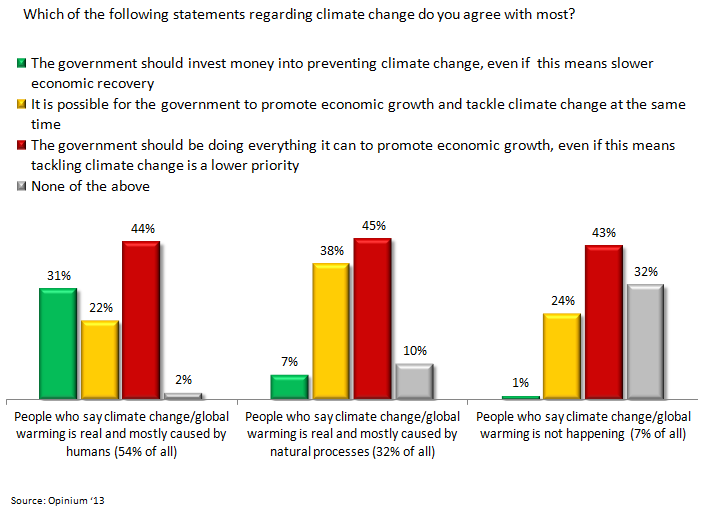 I’ve taken this to indicate there’s a bunch of people who respond to questions about whether they ‘believe’ in climate change as if they’re being asked “are you a tree-hugging leftie who hates business?” – so they say no to that question, but still want the government to do something about climate change. But is that true? 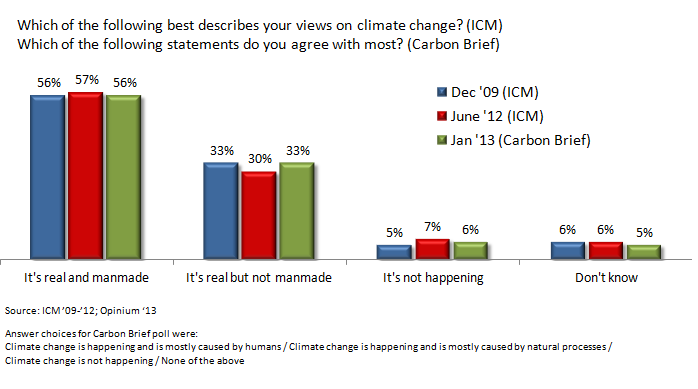 A question in the Carbon Brief poll supports that view, albeit not quite to the extent seen in the Copenhagen poll. A poll conducted in March ’11 and reported 18 months later by LWEC found that only 38% agreed they trusted climate scientists to tell the truth about climate change. This prompted soul-searching among those worried about public perceptions of climate change: if even climate scientists aren’t trusted, what hope is there for building support for action to tackle climate change?